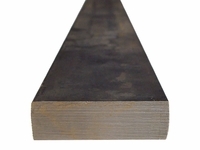 Grade A36 material is a low carbon steel that is designed for structural applications. It offers good formability and weldability. While typically having a lower cost than cold rolled, it does not possess the closer size tolerances that cold rolled does. Also, the surface finish is, by the hot rolled process, somewhat rough.